← TrailerWatch: The Punisher brings the pain…and Metallica! Baltimore Screening Pass-palooza: “Battle of the Sexes”! Tennis. I love watching it, but I can’t play it to save my life. But there sure are folks who can…and the real push for tennis came with the “Battle of the Sexes”, a match between tennis professionals Bobby Riggs and Billie Jean King. So, of course, there’s a film about the event. And I can’t wait. Synopsis! What: ADMIT TWO passes for the Baltimore screening of Battle of the Sexes! 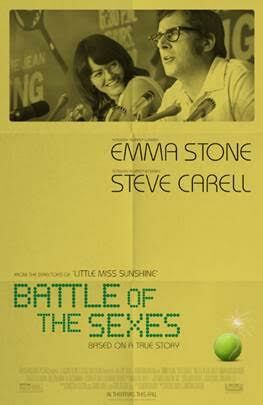 1 Response to Baltimore Screening Pass-palooza: “Battle of the Sexes”!